Quiznos already has master franchisees in nearly 25 countries and territories, but the chain announced that it is revamping international growth efforts and is aiming to be in nearly 40 countries and territories two years from now. Lee Vala, international chief development officer for Quiznos, says the company is targeting Central and South America, Europe, the Middle East, and Southeast Asia as potential markets to expand into. “We have the economic and operational resources to successfully launch and expand internationally,” Vala says. Vala says Quiznos is interested in master franchisees that already have a business infrastructure in their market and can easily pay for start-up costs and convert their resources for Quiznos. Selecting the right master franchisee and preparing them to grow the brand is not something Quiznos is taking lightly, Vala says. He says he is personally visiting prospects in their country before signing a formal agreement. International master franchisees at Quiznos are also getting something that Vala says other brands do not offer: executive training. All new international master franchisees come to the U.S. for an executive training program that teaches everything from supply chain to real estate, from marketing to design and construction. By putting franchisees through this process, which includes access to top Quiznos executives, Vala says they will be able to adapt their brands appropriately to their country. 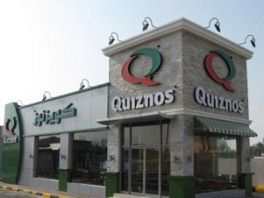 Vala cites the use of halal meat in the Middle East and vegetarian offerings in India as ways in which Quiznos will adapt to international markets. Of course, no brand could expand so much overseas without a solidified hold on domestic business. Vala says Quiznos would not have committed to such growth if it wasn’t sure it was stable at home in the U.S.
“The first thing [prospective franchisees] will look at is the health of our company and our growth rate and our growth plan, and how well we are doing domestically, in order for them to get assurance that we’re going to be able to support them,” he says.